It seems there’s a resurgence of interest in Greek wines currently, and I have filed a few reports recently from retailers specialising in the wines of Greece, including Borders Wines and The Daily Drinker. But one name is synonymous with the modern wave of Greek wines coming to the UK and that is Steve Daniel. Today Steve is Head Buyer for Hallgarten & Novum Wines, but he is also the man who for many years led Oddbins at their peak, when he introduced the first wave of modern Greek wines to the UK in the 1990s. 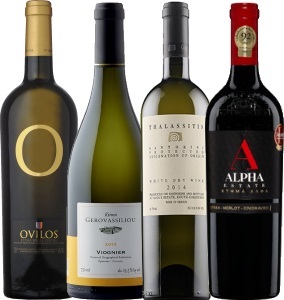 Now, Hallgarten & Novum Wines is once again a major force in importing and distributing the wines of Greece in the UK. A few months ago they put together a touring roadshow of some of their top producers, where I caught up with representatives of the estates below. A relatively new name, Bibla Chora’s organically-farmed vineyards were planted in the foothills of the Pangeon Mountains in 1998 and its first wines released in 2001. Today 48 hectares of vines grow at an altitude of 380 metres in the rocky soils of this district of the northern Greek mainland. “We have an ambition to elevate the reputation of Greek wines,” say Gaia Wines and indeed they have set up operation in not one, but two key wine regions, Nemea on the Peloponnese peninsula and the island of Santorini. It’s also an experimental company, with wild ferment cuvées and even a project which is ageing wines under the Aegean sea. (2019) A Moschofilero and Roditis blend, made in stainless steel, this is fresh and yet ripe with a fleshy fruit character. Fruity and bright, lots of elegant fat lemon and orange fruit, a hint of the exotic and I like the long and bright finish with a little weight and texture too. Though the estate was established in 1995, the first release was not until 2005 after experimention with many varieties – for example, Cabernet Sauvignon was abandoned as the climate was too cold, but Tannat thrived. Vineyards are planted at 600 metres on a plateau in the northwest mainland, in alluvial, sandy-clay soils. Indeed David – a bit of evangelical work still needed to change perceptions – even after several decades of ‘the new Greece’, but the proof is in the tasting. Hallgarten Novum’s Greek range is superb. This is line up of wonderful wines for the summer most of which are incredibly food friendly. There other good wines in the portfolio too. A fav of mine in Monemvasia Winery ‘Kydonitsa’. Cheers Tim – yes, an exciting range, and will look out for the Kydonitsa.